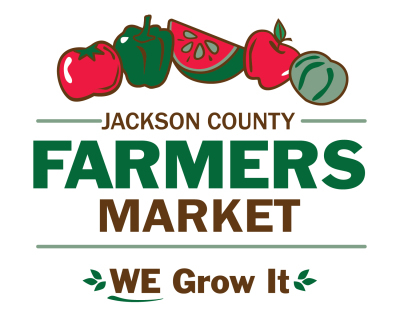 The ​Jackson County Farmers Market (JCFM) ​is very excited to offer educational opportunites to our community members, as well as fun events all summer long. June 22, JCFM, 9a-1p, Coffee and Donuts available! June 29, JCFM, 9a-1p, Coffee and Donuts available! July 4, JCFM, 2p-6p, INDEPENDENCE DAY!! July 6, JCFM, 9a-1p, Coffee and Donuts available! July 13, JCFM, 9a-1p, Coffee and Donuts available! July 20, JCFM, 9a-1p, Coffee and Donuts available! July 27, JCFM, 9a-1p, Coffee and Donuts available! ​August 3, JCFM, 9a-1p, Coffee and Donuts available! August 4-10, NATIONAL FARMERS MARKET WEEK!! JCFM celebrates!! Sign up on Aug. 8 & 10 for your chance to win a FREE produce basket from our vendors!! ​​​August 10, JCFM, 9a-1p, Coffee and Donuts available! August 17, JCFM, 9a-1p, Coffee and Donuts available! August 24, JCFM, 9a-1p, Coffee and Donuts available! August 31, JCFM, 9a-1p, Coffee and Donuts available! September 7, JCFM, 9a-1p, Coffee and Donuts available! September 14, JCFM, 9a-1p, Coffee and Donuts available! September 21, JCFM, 9a-1p, Coffee and Donuts available! September 28, JCFM, 9a-1p, Coffee and Donuts available! October 5, JCFM, 9a-1p, Coffee and Donuts available! October 12, JCFM, 9a-1p, Coffee and Donuts available! October 19, JCFM, 9a-1p, Coffee and Donuts available! October 26, 9a-1p, Coffee and Donuts available!